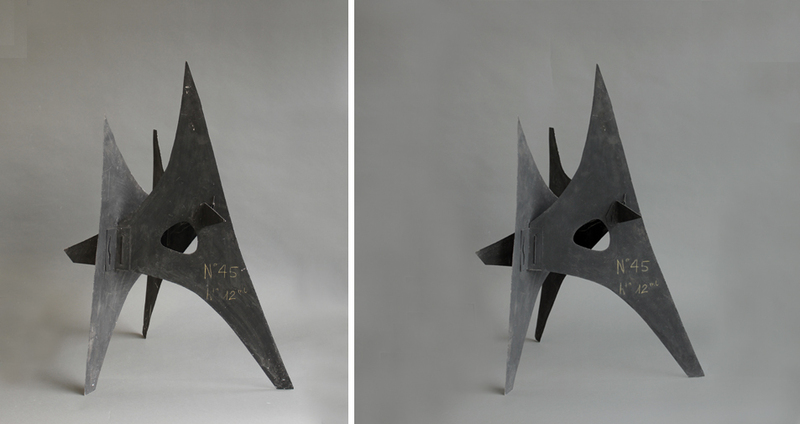 The conservation treatment of Alexander Calder’s maquette for Trois Pics is an example of balancing conservation cleaning techniques employed in paintings conservation with an understanding of the artist’s working methods and materials. The overlying chalk markings are considered part of the object and represent a crucial historical record. Testing revealed that the chalk markings were more readily removable than the surrounding soiling and that repeated cleaning passes would result in tide lines and cleaning marks. A safe yet effective cleaning method was devised that focused on optimal pressure and minimal moisture. Extra care, under magnification, was taken to clean only up to the edges of the historical markings. This sculpture is the maquette for the monumental sculpture of the same name in Grenoble, France.